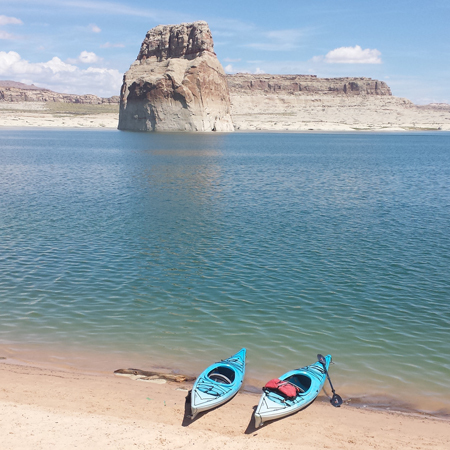 While on an extended camping trip to the North Rim of the Grand Canyon, my wife and I drove down to Lake Powell to see if we could find a place for a short paddle in our kayaks. 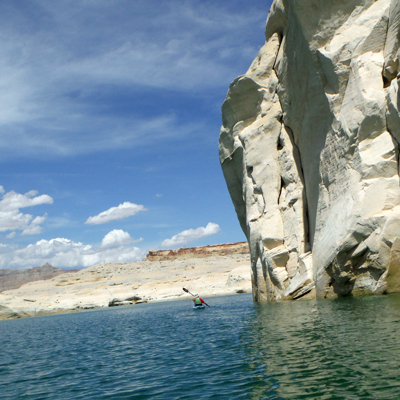 An online search revealed that there were several kayak/SUP rental places in Page. We decided to stop by Kayak Powell Tours and Rentals for some advice. The fellow at the desk was very helpful and we were soon on our way to Lone Rock Beach about 11 miles northwest of Page. 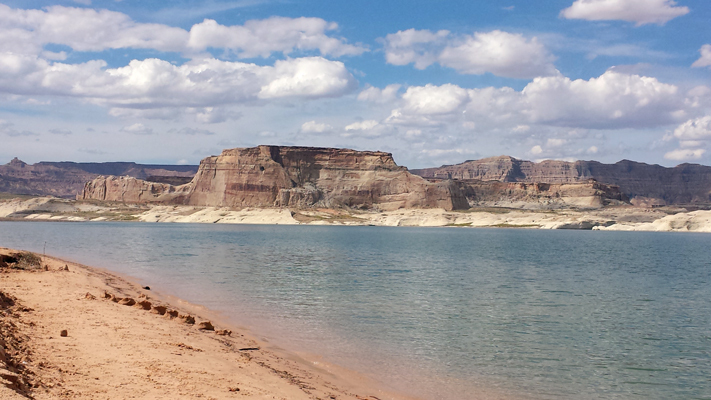 Lone Rock Beach, a part of the Glen Canyon Recreation Area, is just across the Arizona border into Utah. It is said that the beach is one of the few places on the lake where it is possible to drive to the water's edge. On the day that we were there, the beach was not crowded at all. We were really impressed with how clean the area was. The views across the bay were outstanding. Most of the people in the area were playing in the water. The water temperatures were nearly perfect. 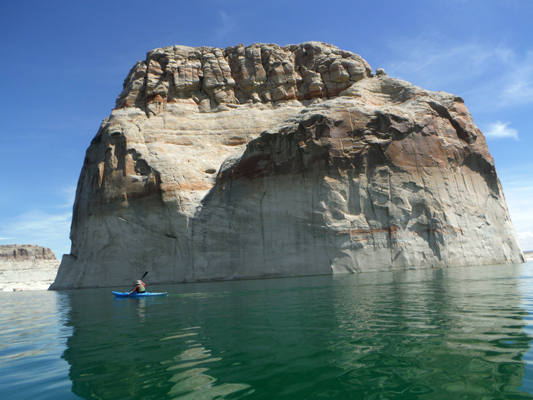 The folks at Kayak Powell suggested that we just find a spot on the beach and paddle to Lone Rock. Then, depending on how much time we had available, we could continue on to a side canyon beyond the rock. It did not take us long to get the boats off the truck and we were soon on our way to Lone Rock. It had been quite a while since we were last out in our boats. Although we were feeling pretty rusty, we were soon cruising past the rock formation. Lone Rock was about .6 of a mile out into the bay. A shadow in the rocky shoreline beyond Lone Rock caught our attention. Could this be a narrow canyon that we could explore? The side canyon a bit northwest of Lone Rock was the next destination. We spent an hour or so paddling several of its fingers. This Google Earth photo is dated April of 2015. 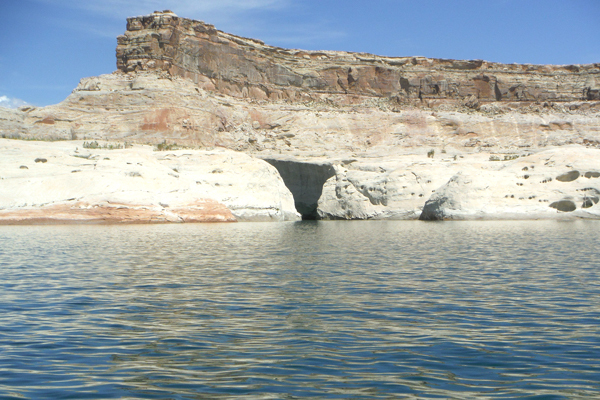 When we were here in late August, the water level had risen and we were able to paddle a bit farther into the arm. These are several scenes from the side canyon. The colors of the water and the rock formations were a great combination! The view toward Lone Rock from back in the side canyon. After the paddle into the side arm as far as we could go, we were ready to make our way back across the bay to the truck. 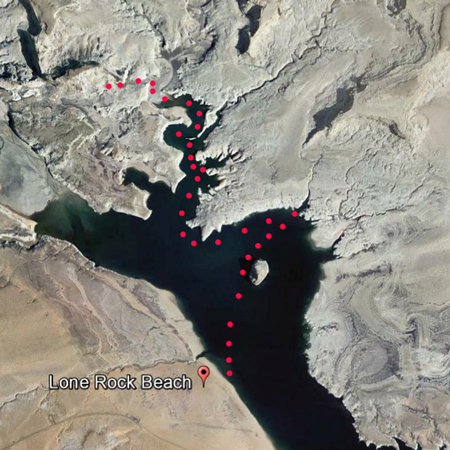 For the return trip we paddled a straight line. Earlier in the day, I had been concerned about crossing the open water if there was any wind. Fortunately, it never came up. For our first paddle in quite a while, we were very satisfied with how this adventure had gone. We paddled approximatley 5.5 miles. We spent several hours after the boats were loaded, playing in the water and "sun-drying" on the beach. Plans for a return trip were also formulated. This day had been a lot of fun.